“Conflict in a team is inevitable. But recognizing it and making it work for you in a team is anything but easy. Most people don’t like conflict and so they don’t want to deal with it; and when they do, they immediately want to extinguish it. So, repeat after me: conflict is a sign of a high-performing team. Now, say it like you mean it! When I was a young assistant professor at the University of Washington, one of my dearest colleagues was John Gottman; you may know him as the world-renowned marriage and parenting researcher. In his long-term, cutting-edge studies, Gottman found that the couples with the strongest marriages—the ones that endure over time—are the couples that fight. Yes, that’s right. They fight; they don’t avoid conflict. However, there is a particular way these couples fight. They fight fairly. For example, consider the difference between one partner saying, “I don’t trust you. You are a creep!” versus, “I am really angry and I feel that I have lost trust!” The first example is a personal attack; one spouse calls the other a name (“creep”). In the second example, the spouse has communicated anger without a personal attack. For Gottman, one of the keys to a successful marriage is the separation of pure anger from personal attacks. I argue that there is a parallel for teams—people in teams spend a lot of time with each other and get in each other’s way, just as the partners in a long- term relationship. Similarly, in my studies of negotiation, I have discovered that win-win outcomes result when negotiators are tough, ask penetrating questions, drill down for the core issues, and are hard on the problem, not the people. In fact, when negotiators are too polite and avoid sensitive topics, they are more likely to settle upon lose-lose outcomes. In one of my research projects with Erika Peterson, we observed how teams of friends negotiate and compared them with teams composed of strangers. At first blush, it would seem that teams of friends would have a distinct advantage over teams composed of people who had no working relationship. Well, we were wrong. Teams of friends were excessively preoccupied about their relationships, and this interfered with their ability to focus on the task of negotiating. Things got even worse when the friends needed to depend on one another for information and when they had to report to a boss. In this case, teams composed of complete strangers actually reached more win-win agreements than did the teams of friends. Excessive concern for the relationship effectively shut down the ability of the teams to search for and integrate valuable information. Being polite is not conducive to the creative crafting of win-win negotiations. Your 10,000 Hours—Are You Using Them? “In 1993, psychologists Anders Ericsson, Ralf Krampe, and Clemens Tesch-Romer published research indicating that no one becomes an expert until they have studied and practiced about ten thousand hours, or approximately ten years of concentrated study. Remarkably, that seems to be true for chess players, ten­nis pros, business executives, and computer programmers. This looks daunting, right? However, anyone who has worked in the business world for at least five years (assuming a forty-hour workweek) has potentially accumulated enough hours to be an expert! If you consider a forty-year-old businessperson who took his first job at, say, age twenty-five and has worked eight-hour days for fifteen years, the time adds up to well over ten thousand hours. The question is: are you using the ten thousand hours of experience you have gained on the job to learn? The challenge is to start making expert sense of your business experience! “The creative conspiracy begins with one simple idea, followed by a commitment that the next meeting with your team will be different. There is a very good chance the meeting will be more productive as a result of your intervention. It is unlikely that what you do at that meeting will negatively affect your team in the long run. If your plan does backfire, tell the team what your intention was and ask how that goal might have been better accomplished. In fact, groups that reflect on how they work, what they do wrong, and what they do right perform better than groups who don’t reflect. Thus, by orchestrating such a conversation, your team is now part of the conspiracy. Ask your team if you — or, for that matter, anyone else — can have a hand in organizing the next week’s meeting. Leigh Thompson is the J. Jay Gerber Professor of Dispute Resolution & Organizations in the Kellogg School of Management at Northwestern University. She is the director of the Kellogg Team and Group Research Center, a research-based community of scholars dedicated to understanding and improving the performance of work teams in organizations. Dr. Thompson is also author of several books, including The Mind and Heart of the Negotiator, Making the Team, and The Truth About Negotiations. Dr. Leigh Thompson’s research focuses on negotiation, team creativity, and learning. Reprinted by permission of Harvard Business Review Press. 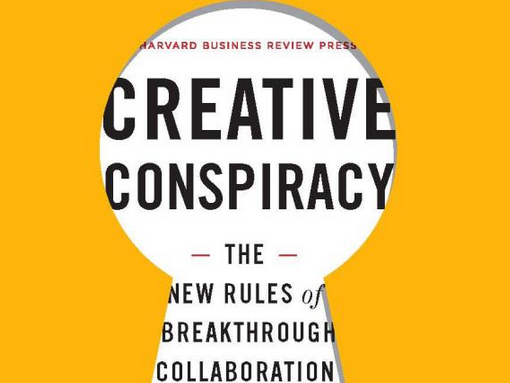 Excerpted from Creative Conspiracy: The New Rules of Breakthrough Collaboration. Copyright 2013. All rights reserved.